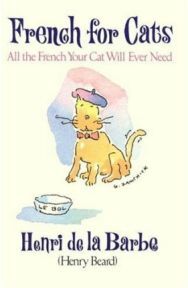 If you are thinking of house-sitting in France this summer and are worried that you won’t be able to communicate with your hosts’ cat, then this is just the book for you. When the cat says meow, is it trying to say, “Here comes a fur ball,” or “I did not break that vase”? All will be revealed in Henry Beard’s mini bilingual book of catspeak. With English phrases given first followed by French translations in italics and accompanied by illuminating illustrations, each page gives us a rare insight into the inner workings of a feline brain. We are first introduced to The Major Cat Parts (of the body), and these are followed by The Basic Cat Wardrobe consisting of a bell, flea and tick collar, and name tag.